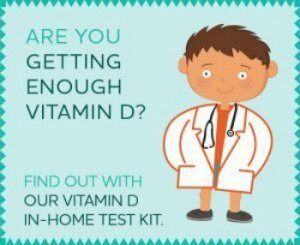 Vitamin D and Breastfeeding SHOULD be one of the hottest topics in women's health today, but this INCREDIBLY important subject is being almost completely overlooked by doctors- which could have disastrous results with lifelong consequences for you and your baby if you do not address your needs for this VITAL nutrient. Despite the thousands of research studies that have been done, and despite the cries by vitamin D researchers to urge higher vitamin d intakes, doctors still don't address the need for higher vitamin D levels in pregnancy and breastfeeding. Instead, they still promulgate a myth that breastfeeding doesn't give the baby any Vitamin D. Keep reading, and we'll show you that this myth was busted long ago. cases of cancer and other serious illnesses may be reduced"
Cedric F. Garland, Dr. P.H. F.A.C.E. Well, Vitamin D is being shown more and more to be a factor in lifelong health. Vitamin D is important to prevent future problems for your child. Even in the womb, not getting enough Vitamin D During Pregnancy has lead been connected to later incidence of osteoporosis, dental enamel defects and even schizophrenia! And while most of us believe that we and our children are all getting plenty of Vitamin D, the soft bone disease of Rickets is Back and in numbers that doctors have never seen in their entire careers. And part of the reason that rickets is back is the rise in concerned mothers who are breastfeeding their children exclusively and for longer periods of time. While exclusive breastfeeding is AMAZING, your baby can only get what you have, and studies are showing that up to 85% of the population is vitamin d deficient- even supposedly 'healthy' pregnant and lactating women. If you think that because you've been taking your multivitamin and drinking milk every day that you have plenty of Vitamin D for you and your baby- you'd be Completely Wrong!! In fact, after taking your multivitamin for 9 months and drinking milk every day, you are likely to still be SEVERELY DEFICIENT unless you regularly sunbathed during pregnancy! When you read the Vitamin D Requirements page, you'll see that the AVERAGE non-pregnant person needs, according to researchers, between 3800 to 5000 IU's per day!! So, your 800 IU mulitivitamin and two glasses of milk is about ONE FOURTH of what the 'average' person needs. But as you'll soon see, you may need almost double that in order to get enough vitamin d in your breastmilk to meet you and your baby's Vitamin D and Breastfeeding needs! 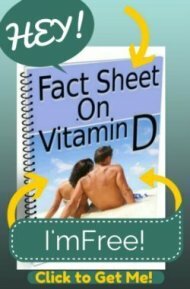 Contain Vitamin D, or Not? 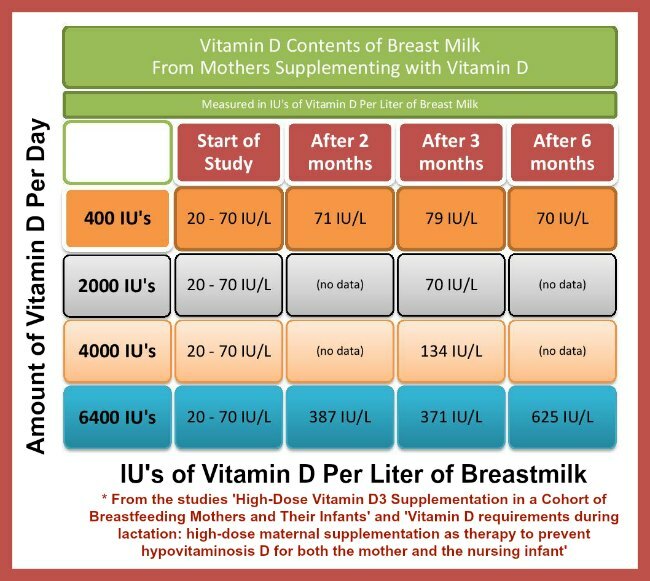 20 to 80 IU's of Vitamin D per LITER of breast milk. This is FAR FAR too low to even be preventing RICKETS, let alone getting your baby enough to prevent the Vitamin D Deficiency Symptoms that you AND your baby will be headed for if you don't get enough Vitamin D.
As you can see, you need to take AT LEAST 4000 IU's per day in order to get your baby barely 100 IU's per day of Vitamin D strictly through breast milk- barely enough to ward off rickets and FAR from the RDA requirements of 400 IU's per day. So, it appears that the only dose of Vitamin D that gave babies enough vitamin d to meet their RDA daily requirements was the group that received 6400 IU's per day. And this dose was safe with zero cases of Overdose on Vitamin D and no adverse reactions in the babies. Why Not Just Supplement Your Baby? For the Vitamin D and Breastfeeding question, that is one way to go about it and to make sure that your baby gets the RDA of Vitamin D, but what about YOU? If you ignore your Vitamin D Requirements or simply take the RDA of 600 IU's for adults, then you could end up like the women in This Study who lost significant bone mass during lactation. And since there is a strong correlation between Vitamin D and bone mass, and that sufficient vitamin d levels help to absorb calcium, and that Vitamin D and Breastfeeding needs high levels of Vitamin D to get enough vitamin D to meet a baby's needs, it simply makes sense that if YOU take enough Vitamin D in order to adequately provide for your baby, that you will be less likely to have so much calcium loss during your lactation that you put yourself at risk for decreased bone density later in life. 100,000iu dosage a week and still nursing?? Vitamin D for Infant & Mother? Can I lose significant Vitamin D from making babies and breastfeeding?